With the Valentine's Day holiday approaching, I needed to come up with a kid's craft for the classroom. 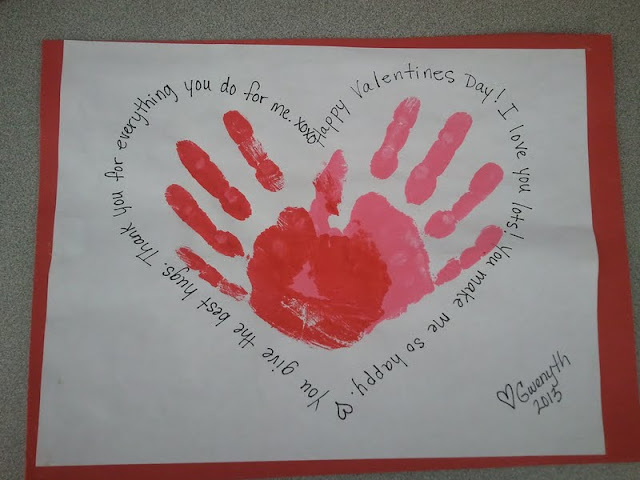 I saw something similar to this on Pinterest and thought it would be a quick, easy and sweet Valentine that the kids could give to someone as a gift for the holiday. First, I drew a large heart in pencil on plain copy paper. Then, with a sharpie of course, I wrote the Valentine message on the outline of the pencil. When I was finished, I erased the pencil line. I made 21 copies of the heart on regular copy paper. Easy peasy, lemon squeezy! The next day, I took one student at a time, because they are messy littles, and painted red or pink paint on their little hands. We placed the hands in a way that filled the heart and voila! We let the paint dry and I wrote each student's name on the bottom of the craft. I got a lot of feedback from parents and grandparents that they loved this project! They did turn out sweet. They were fairly easy to make, with very little prep work. And bonus was that the kids loved painting their hands. I highly recommend only doing one student at a time. We did this during computer lab time so I only had to wrangle one kid at a time. Every month, we have a writer's celebration to celebrate the publishing of their newest piece. And as any good celebration, we always have snacks! Since we were about Valentine's Day'ed out by then, I went for a St. Patricks Day theme. 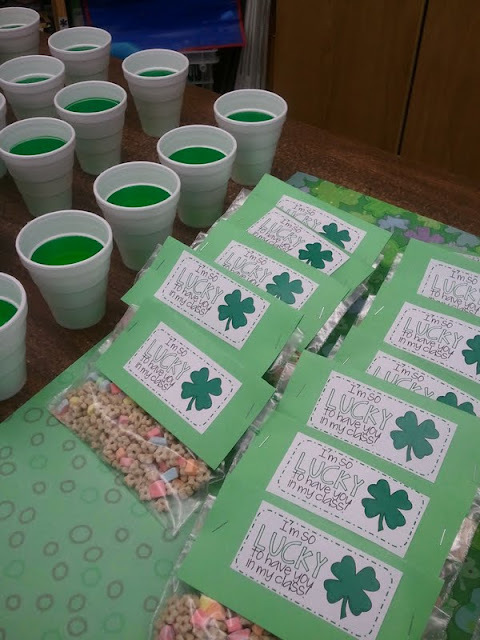 I hopped on over to the faithful Pinterest (you should follow me) to find some St. Pat's snack ideas and found this. She had the printable graphics for the toppers. They were supposed to be labels but I didn't have that size. Instead, I just printed the graphics on regular paper, cut them out and glued to pre-measured, pre-cut green construction paper. I bought two boxes of Lucky Charms for 21 kids. I had my five year old scoop about 1 cup of cereal into a Ziploc bag. She had fun and it saved me time! Then I stapled the topper on. All together, the prep and construction of these was roughly 30 minutes. And of course, we needed something to wash it down, so I pre-measured two packets of green KoolAid and sugar in a container. Added water at school, stir and serve. So while it looks like I go all out, it is really fast and cheap tricks that make me look like an over achiever. I will share more classroom cheap tricks that make you appear to be highly vested in classroom preparation soon. Stay tuned, friends! If you enjoyed this post follow Dalai Mama on Facebook and Twitter!